A thousand years in the future, mankind's influence expands into the universe. 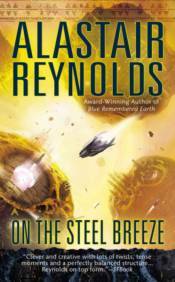 Alastair Reynolds' epic vision of our journey into deep space will redefine Space Opera. Chiku Yellow is earthbound: living a peaceful life on a changing world as humanity explores a thousand new ways to experience life. Chiku Red is space-bound: blasted into deep space to investigate Eunice Akinya's last journey, and maybe discover the final secrets of space travel. Chiku Green is planet-bound: travelling thousands of lightyears to the planet Crucible. A new home for humankind; it's a habitable planet hosting a fascinating alien labyrinth. All three are Chiku Akinya. All three are pivotal to our future in space.